The microwave is such a wonderful invention for a busy mom…it can cook a quick breakfast or heat up lunch in no time, and it keeps our forgotten cups of coffee warm when we don’t have time to drink them while they’re hot. If the inside of your microwave is covered in crusty old food splatter, you might be reluctant to tackle it, no matter how disgusting it looks, because that stuff is pretty much glued on there. It would take A LOT of time to try scrubbing that crusty food off the walls of the microwave, and nobody has time to do that. Instead, try using some lemon, water and some heat from your microwave to get it clean. How do you clean a microwave with a lemon? 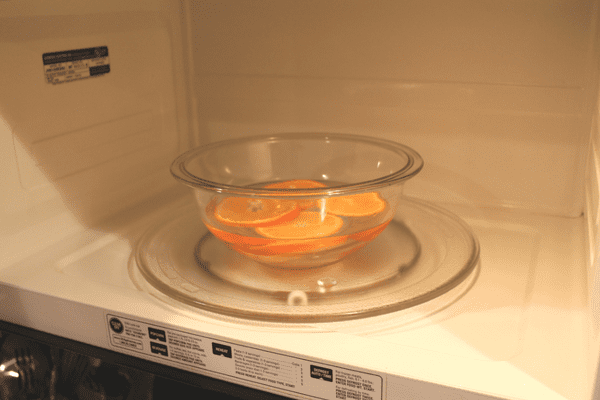 Using a lemon to clean your microwave is a great trick, because while it helps to clean off that old crusty food, it also works to deodorize your machine, leaving a fresher-smelling microwave. To do this, simply fill a microwave-safe container (glass or ceramic) about halfway with water, then add in a cut up lemon. You can also use an orange or a lime if you don’t have a lemon on hand. Place the bowl inside the microwave and heat for 3 minutes or so, until the water comes to a boil. Then let the bowl sit inside the microwave for another 5-10 minutes, without opening the door. What you want is for the lemon water to turn into steam, which will soften that crusty mess inside your microwave, making it MUCH easier to wipe it away. 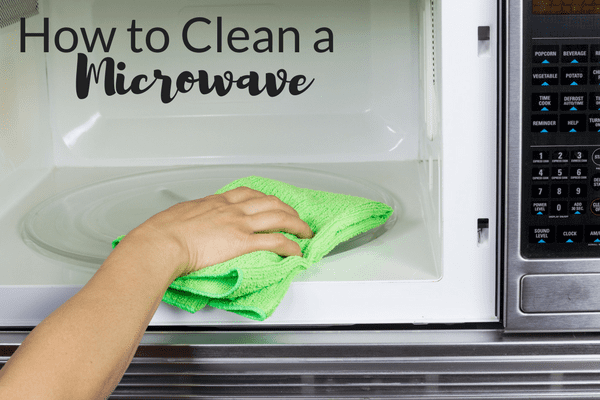 After your 10 minutes are up, take the bowl out of the microwave, using potholders, and wipe down the inside of the microwave with a damp sponge or cleaning cloth. How do you clean a microwave with vinegar? If you don’t have any lemons or other citrus fruit in the house, you can also do this trick with some vinegar. Use a couple of tablespoons per cup of water, heating it like the lemon water above. This works just as well as the lemon water to clean the gunk off the sides of the microwave, but it doesn’t smell as nice as the citrus. If you want a more pleasant smell, try wiping the sides down with soapy water, using a nice-smelling dish soap, like Mrs. Meyer’s Lemon Verbena (I get mine from -affiliate link- Grove Collaborative). 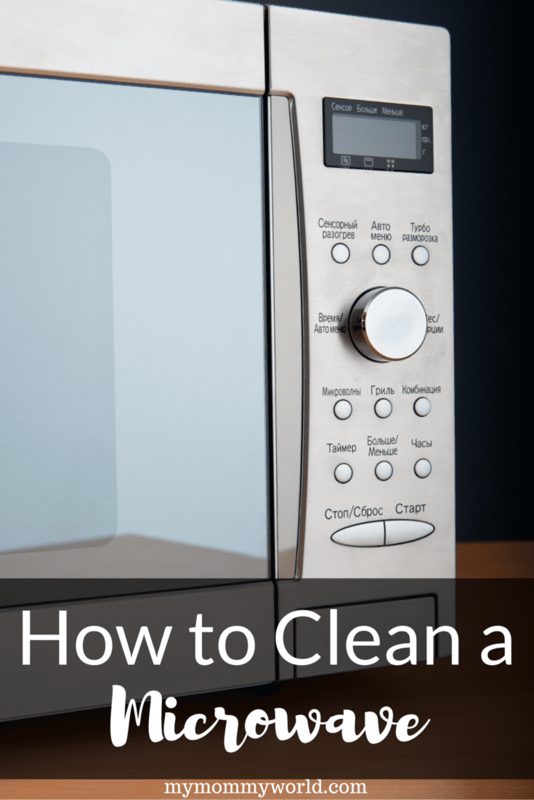 The best way to clean your microwave is to prevent any spills or splatter from happening inside your microwave as you use it. Make sure to cover any cups or bowls with a paper towel or a plate in order to avoid anything splattering on the walls of the microwave. Great tips! I’ve used plain water to clean the microwave but I’m sure the lemon or orange would make it smell so much better. After the butter splattered everywhere, it made me stop and clean the microwave. I love it when my microwave is nice and clean. Now to remember to cover the easy to splatter items before I microwave them. Ugh, I hate it when I do that! I’m usually pretty good about covering things, but when I forget, it can be such a big mess!